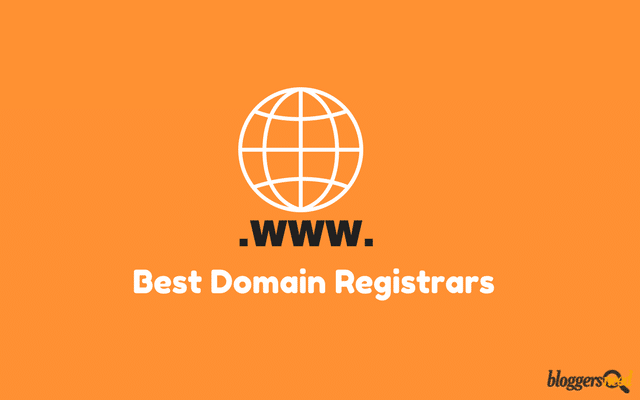 Read our Official best domain registrars list first and after check my hosting providers for websites because after purchasing the right name for your online business the next thing you need to have is a proper web hosting provider and best WordPress themes. Owning a domain is important for online business whether you are registering your personal brand, opening a coffee shop or whatever it may be but it is necessary to have to register a business name on internet to get more exposure. Every successful internet marketers know the benefits and importance of owning a website to run their business to make out steady income. Buying a domain is not all a hard job, and you can buy with your credit card or PayPal within few minutes, and there are numerous domain sellers are available to give you name based on your choice. 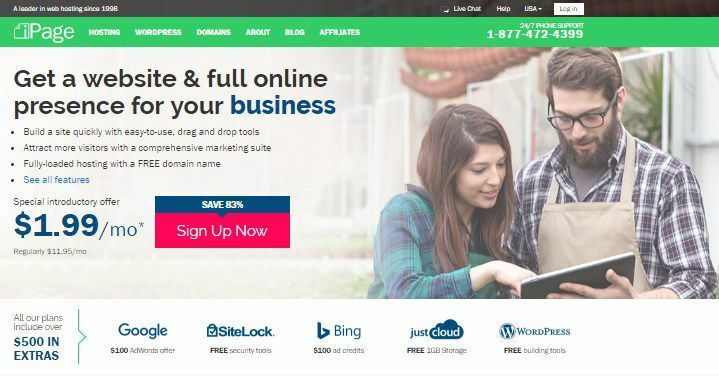 But you need to purchase a website name from authorized providers because there are many possibilities where you could lose your website business name over night. Upon considering your future in the online business and to start your journey in a safe place I have provided the list of top websites where you could buy the domain with your desired name with full protection. What is Domain name registrar? A domain registrar is a service or company that officially allows you to register your desired name which you would like to own for long term or short terms based on your needs. Check the value of service. Find if they have any hidden charges. Check if they have best add-on services. Namecheap is ICANN-Accredited Registrar, and my preferred domain name register as the brand name itself contains cheap at the beginning which is the main motto of the company to provide domain names for the low price. The company started by Richard Kirkendall who is the Founder and CEO of Namecheap. The headquarters of Namecheap is located in United States, California and Los Angeles and from the founded the year 2000 and till now the company running successfully by its performance. Namecheap currently has a record of holding more than 7+ million domains and 3+ million customers approximately in their database. From domain registration to hosting Namecheap has top services which I like most to use their service and not only the Top domain sellers but also good in web host services from shared hosting to dedicated servers and every hosting plans are providing best grade performance. And currently having two domains hosting at Namecheap and is going good so far and I never faced any downtime and website is loading below 2 seconds which is great SEO factor. If you are looking for cheap service, I would recommend Namecheap to use. If you are looking to buy the domain in bulk orders, Namecheap is the big boss for bulk domain name registering and also they are best in providing bulk TLD’s(Top Level Domains) both generic gTLD’s and country code ccTLD at the cheap price. Domain Management is flexible with an advanced control panel. Reliable and Robust DNS performance. Solid Security which makes all your information private and not seen by others. Cheap domain name registrar compared to others. Providing TLD’s in Cheap rate which I love most. Free Comodo Positive SSL and whois guard for one year. The best place to buy the domain in bulk option. 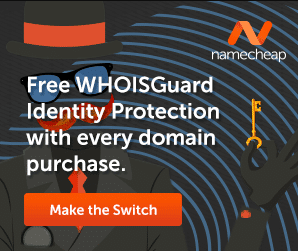 In Namecheap whois guard free for new domain registrations and transfers for Lifetime. There are no cons to provide. As an internet products reviewer, I highly recommend Namecheap for buying your domain name because Namecheap gives top valuable service to its users and all of your domains will be safely protected on all times with powerful security tools. Limited Offer: 10% Off Coupon Code Available for new domain registration and transfers : Click here to get coupon code. Godaddy is the second best domain registrar having more than 16+ million worldwide and more than 70+ million domain currently under management. And GoDaddy was founded in 1997 by Baltimore, Bob Parsons, Maryland. By having more than 6000+ employees working in GoDaddy, you can buy the domain name at any time, and with 24/7/365 support center they will always reply instantly within few minutes and having the team of experts they will guide to buy domains at the lowest price. GoDaddy is one of the best places to purchase domain at the most reasonable price, and they even provide discount coupons, codes and run offers regularly to satisfy their new as well as old customers. Web developers would probably know how to create blog starting from registering the domain to setting up hosting and installing themes etc. But For ordinary people, it would be a difficult task unless they hire someone from Fiverr. Making your website to go on live. By paying some extra cash, they are doing this kind of services. Having its own Cpanel which makes the task difficult. Low disk and database space in one account you can’t keep more than 25 domains. The Register is another leading domain name seller offering many services like website building, SEO services, hosting services and marketing services. It is one of the old domain registrars to start the company in the year 1994 by Peter Forman, Dan Levine and Richard and the company is ICANN registered. As per current records, Register.com is having more than 2 million domains with over 800K plus customers all over the world. 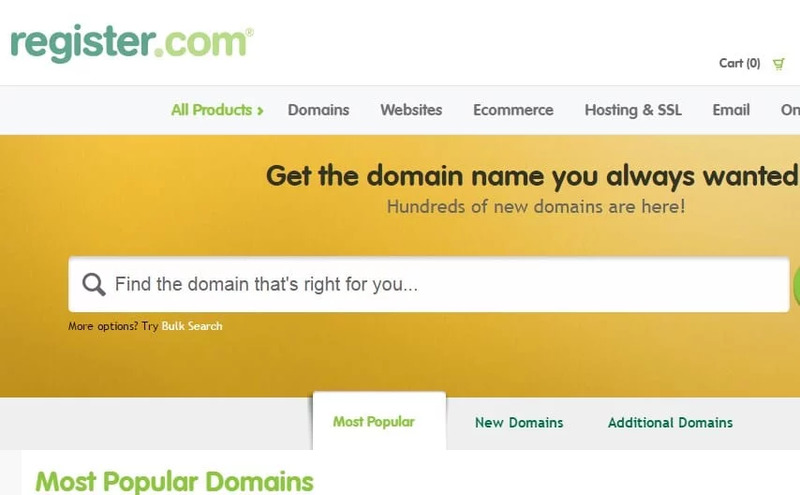 In register.com you can buy top domain extensions like .com, .org, .net, etc. for the cheap price. The user Interface is simple which makes super easy to buy any domains without any complex steps. Register is also offering web hosting services at the affordable price but honestly speaking I never hosted domains so don’t know how the hosting services would be. But you can ask about hosting services by chart support. Control panel provides best features like viewing site traffic. FastComet is doing the service more than 7 years with the latest technology and regular updates they are now rocking the web hosting industry and continuously outranking the big brands by giving the valuable service to the users. FastComet hosting company won many awards like best user choice of the year and excellent customer service the award given by Hostadvice the largest web hosting community for web hosting experts and users and recommended by hostadvisor another popular web hosting community. 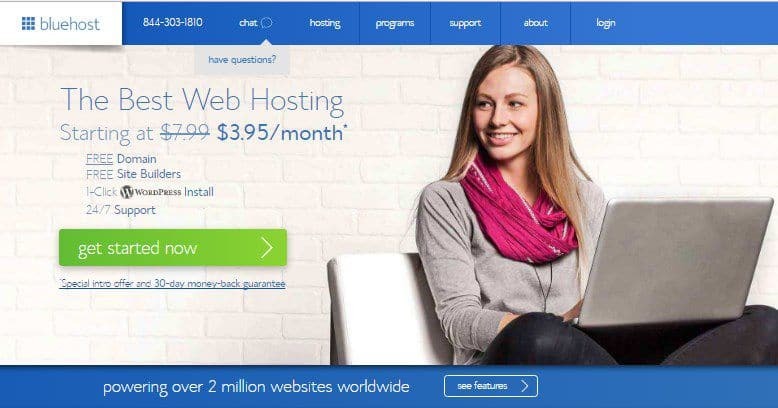 And currently their hosting service is too perfect to use, and popular web host reviewers like hostadvice gave 9.8/10 rating voted by their users. 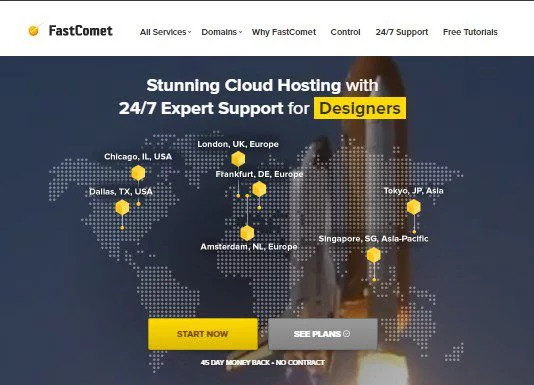 For some people, this domain seller may sound new to you, but honestly, I am one of the big fans of FastComet and this website currently using shared hosting plan, and you should check FastComet Reviews to know more about its service and quality. 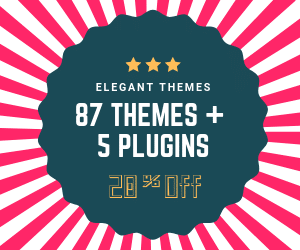 FastComet offers 568 types of stylish domains extensions like .online, .music, .inc, .pizza, .beer, .bar, .wine, .adult, .pet etc. FastComet hosting is super good, and they got the server in 8 locations. 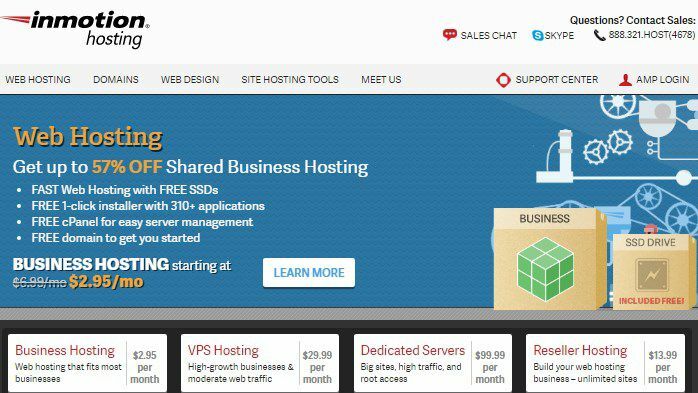 Bluehost is the leading domain provider founded in 2013 owned by Endurance International Group and with their continuous support now more than 2 million websites are currently hosting on their servers. Also, Bluehost is the No #1. best wordpress hosting and you can see the listing of Bluehost in the wordpress official page. And in the top list of wordpress hosting Bluehost is in the first position. So without doubt Bluehost is the trusted web host with reliable services. If you are starting a blog now and searching for top web hosting with the modest price my recommend without the doubt is Bluehost. Not only for the web hosting rather it is the top place to buy the domain at the affordable rate and you also buy Top-Level Domains (TLD) and SSL Certificates and giving free Shared SSL certificates as well. So here is the reliable source to buy the domain from the trusted and safest place in online. Talking about Bluehost on web hosting service side can have some issues, but there is no problem in buying domains. Ipage is another popular web hosting provider and the great place to buy domains founded in 1998 by Thomas Gorny, and like Bluehost now the company is owned by Endurance International Group. Now Ipage is in the hosting field more than 10 years which makes them a favorite and trusted hosting provider. Like other hosting provider shared hosting plan, Ipage shared hosting plan also allows users to host unlimited domain names under one account on monthly fees. Ipage is not only popular for hosting service but well know domain registrar to buy domains from single to bulk numbers at affordable rates. Best domain registrar for buying country level extensions. Inmotion hosting is another domain name registrar and top rated web hosting company running more than 14 years which founded in 2001, and its operating system is based on Linux and Unix. The company got the huge range of hosting services from dedicated hosting to reseller hosting services. Also offers many types of hosting features like shared, SSH, Ruby, SSD hosting. Not only famous for hosting but also sells domain with secure web Transactions and company is ICANN registered so feel secure to buy a domain name in inmotion hosting company. This domain registrar will give a new website name and also if you have any existing one you also can transfer that name and when a buy a hosting package you get a free domain for one year. 1and1 is Germany-based web hosting company owned by United Internet, and the CEO is Robert Hoffmann. 1and1 is the leading web hosting company having high-end servers in 10 different countries. 1and1 is a cheap domain registrar and got the wide range of internet products such as hosting, buying the domain name, email accounts with affordable rates. With 1and1 you can find a good website name for your medium or high scale business, and now there are many new extensions like .store, .me, .pro, .club, .online are available to buy at different prices. You can also register Top Level Domains Like ccTLD, gTLD, nTLD in the 1and1 hosting company. Because of its extended features and top-notch performance the 1and1 company is considered to be the reputable domain registrar to find the website name at best prices. If you search in google, you will witness more than thousand of domain name sellers ready to afford you the name of your choice. But it’s important to register in legitimate domain selling companies to avoid future problems, and I am sure that you will see the best domain registrars in this list. And additionally, if you want to buy a website name with free SSL certificate and free whois privacy then go for Namecheap because they are cheap and reliable. Or looking to buy both hosting and name in one place then FastComet will be the better choice with claiming free domain for lifetime. If you notice any of top domain name sellers missing in this list do drop the name in the comment so I can add it up. I am Abdullah Prem, Turned Entrepreneur By Following My Passion "Successful Affiliate|Digital|Social Media Marketer. To date, I was only hearing about the GoDaddy, for domain registrars and hosting. I got amazed to see the great list of best domain registrars. The good thing I like is free SSL and Whois Privacy, very important to secure your privacy and avoid privacy leak. 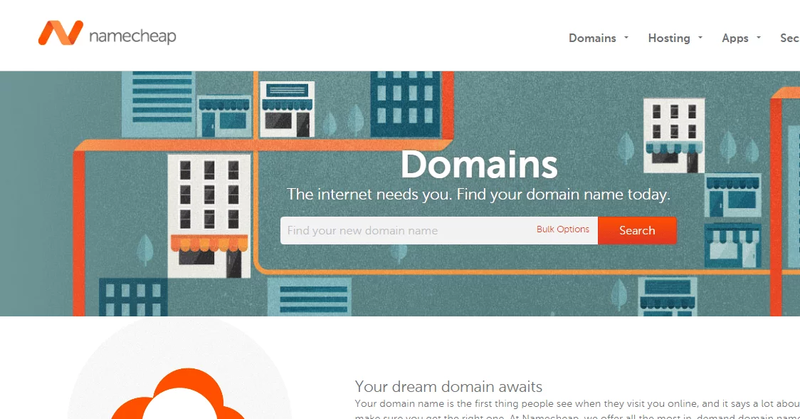 NameCheap sounds great for new domain name register at lowest price. Also customer support is superb comparing other with free secure socket layer. Now whenever I need to register a domain name, first compare the price the list of each domain registrars. You are absolutely right these registrars are always come for support whenever we are in problem regarding the domain name. Thanks for the informative post, Abdullah. Thank you for letting out your views on this article.. Thanks for your recommended here. I just go to namecheap and chat it to the domain cs there. And got the the answer what I’m looking for. Namecheap allow me to get a Whoisguard Privacy and Comodo PositiveSSL ($1.99/yr), for a domain name. So, is that mean, I’ll got a domain + 2 of both above with $10.87 + $1.99 = $12.86 ONLY! Hi Richard . i am happy for choosing Namecheap to buy domains. Another great article as usual. If I have to choose one from this list I would like to go with godaddy. Cause godaddy gives cheaper domain in comparison to other registrar. Anyway thanks for the sharing this list. Godaddy is also good domain seller but Namecheap is even better. After six months of using I realized iPage is the best choice for people who thrive in chaos and financial loss! It’s faster just to throw your money in the trashcan. Dear friend, DO NOT jump to conclusions when reading positive reviews about iPage or another hosting. Learn the other side of the coin. Namecheap is probably one of the best registrars and is also a good hosting company. I have a good experience with the company so far. Thanks for all these suggested domains registrars. Yes, NameCheap is probably one of the best rest of them. 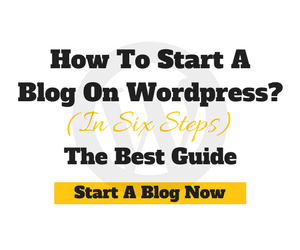 Bloggers Need is the best source to learn about Blogging through WordPress.